You can order ANY House of Troy lamp model through us! Click to download the catalog. High quality accent light adds polish to your art. Classic dimensions, soldered seamless end caps and a superb finish. Lampshade on horizontal arms that extend 5 to 7 inches from artwork. 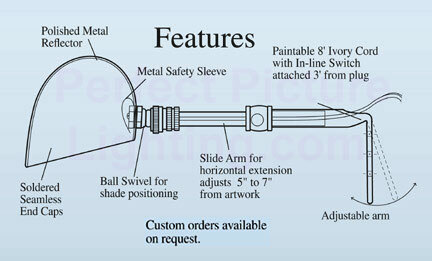 Ball swivel joint adjusts shade to the perfect angle.